Today, Essity, the producer of the Tork brand of Away-from-Home professional hygiene products, announces the release of the 2015 Tork Report, a survey and comprehensive evaluation of sustainability today and an outlook of its future. Philadelphia, PA – June 23, 2015 – Today, Essity, the producer of the Tork brand of Away-from-Home professional hygiene products, announces the release of the 2015 Tork Report, a survey and comprehensive evaluation of sustainability today and an outlook of its future. The report is part of Essity’s ongoing commitment to help its customers identify and respond to industry-specific sustainability priorities. Though the movement appears to have plateaued, the 2015 Tork Report suggests it should be viewed as a lull, during which companies are weaving sustainability into their business models one-by-one and preparing for the next wave of innovation. Despite the growth of sustainability in the B2B industry, businesses across the United States have struggled to establish meaningful sustainability goals. The Tork Report survey of B2B professionals found that although most companies (86 percent) have shown sustainability has value and are actively pursuing sustainability initiatives, the majority haven’t set goals for future reductions in their environmental impact. At the same time, nearly half of respondents (47 percent) believe sustainability will become more important in the future, suggesting that sustainability is not only here to stay, but should be prioritized. The Sustainability 2.0 Mindset: In the past, companies have largely focused on improving profitability by singular initiatives like waste reduction and energy efficiency. Organizations also began using sustainability to differentiate themselves from competitors. However, with increasing pieces of environmental legislation, companies may soon find themselves spending more time complying with new policies than exploring innovations to help their bottom line and protect the planet. The Next Wave of Sustainability Innovation: The progress of the sustainability industry seems to have flat-lined, but in fact, businesses are just gearing up for the next move. Largely, baseline sustainability initiatives meant to cut costs and use resources more efficiently have been implemented. However, there is growing concern that further advances in sustainability may be cost prohibitive to implement and could put organizations at a competitive disadvantage. A Path Forward for Businesses: Though one in six businesses say they don’t know where sustainability is headed in the future, many still believe it will play an even greater role. One step toward achieving the next level of sustainability is to use lifecycle assessments to measure the environmental impacts associated with a product, process or service. Companies can begin to create this momentum by incorporating new business models and setting the standard for sustainability, moving the needle forward. Less than one in four businesses thought sustainability was a reason for their success, but almost three-quarters (70 percent) of respondents felt that sustainability played some role in why consumers bought their products. About one in four companies said that while sustainability is not a requirement for their suppliers, it is a factor considered when selecting a partner. More than half of businesses (~55 percent) do not think they’re affected by climate change. However, severe weather has affected a number of industries’ supply chains in the last several years. 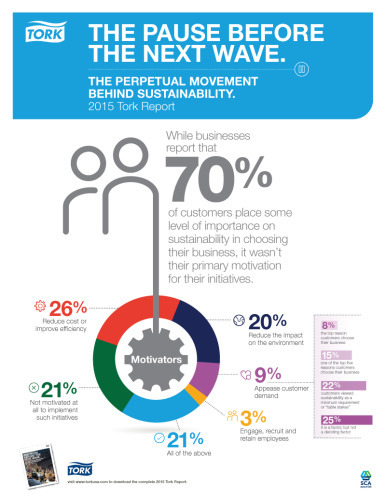 To learn more about sustainability or to download a copy of the Tork Report, visit http://www.torkusa.com/Resources/downloads/Tork-Report/.